The information here is specific for the firmware for the STM32F4 MCUs. The firmware for the STM32F103 is constructed in a similar fashion, but the MCU does not have any 32-bit timers, which limits the integration time to 2¹⁶ / 800 kHz = 81 ms.
It’s possible to chain TIM1 and TIM3 on the STM32F103 to construct a 32-bit timer, and then handle the SH- and ICG-pulses in an interrupt (feel free to improve). Looking at the timing requirements for the TCD1304 you quickly realize that it will be a small nightmare to toggle three GPIOs with for/while loops within the tolerance needed. Luckily this can be handled with the timer peripherals on the MCU. The TCD1304 requires a master clock (fM) with a frequency in the range of 0.8-4 MHz. The datasheet gives a typical value of 2 MHz. 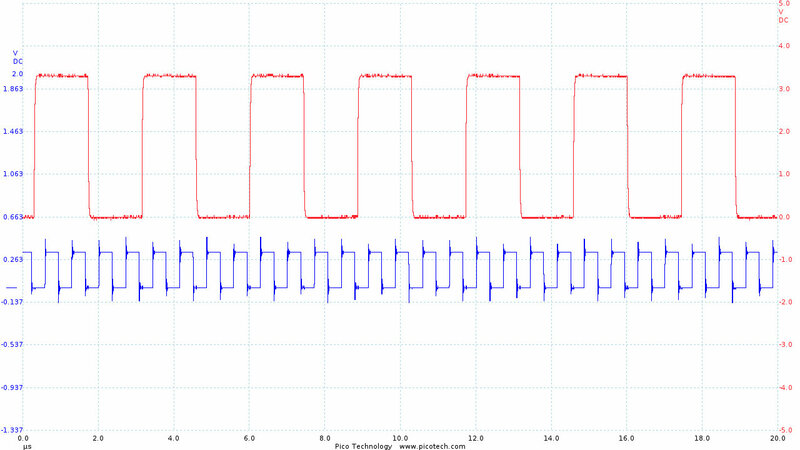 The CCD output data-rate is 1/4·fM and the ADC must be able to keep up with this. The fM-frequency is set in main.h. There are eight timers on the STM32F401RE. Two of them are 32 bit and the rest are 16 bit. For fM, which has a short period, we (obviously) choose a 16 bit timer (TIM3). The data-rate is 0.50 MHz, and to start the conversion of each pixel at the proper time, the ADC is triggered with the 16-bit timer TIM4. As with TIM3 this timer also runs with a clock of 84 MHz, so the period is set to 168. On a side-note, enabling/disabling TIM4 starts and stops the ADC+DMA, without the need to reconfigure the DMA-controller and ADC. The ICG pulse (blue) and the ADC-trigger (red). The ADC trigger is not normally tied to a GPIO. Notice the time-scale. The ADC-trigger is only active for 7.4ms – the time it takes to collect all 3694 pixel values. The SH-pulses control the integration time, and the ICG-pulses the moment the pixel-values are sent to the shift register. Obviously it is desirable to be able to integrate over very long periods of time, so these pulses are controlled by the two 32-bit timers TIM2 and TIM5. ICG (red) and SH (blue) pulses for driving the TCD1304. NB: These are not inverted. Driving the TCD1304 in normal mode. SH- and ICG-periods are identical. Driving the TCD1304 in electronic shutter mode. The ICG-period is an integral multiple of the SH-period. The integration time is defined by the SH-pulse. Whenever TIM5 creates an ICG-pulse, it also generates an interrupt which enables TIM4. This way the ADC is restarted every time the TCD1304 outputs its pixels. When the firmware receives a request from the user for a new recording the timers are not immediately configured with the new SH- and ICG-period. Pulse sequence associated with reconfiguration of the timers. The integrations can potentially be very long, and rather than waiting for two long ICG-periods, the CCD is flushed twice with a very short integration time (10 µs), before the timers are setup with the new SH- and ICG-periods, as shown in the figure above. The 1st and 2nd ICG-pulses show the previous setting of the ICG-pulse. Between the 2nd and 3rd ICG-pulse a new request is received. The ICG-period is set to 15000 and the SH-period is set to 10 µs. After two short ICG-periods (3 pulses), the timers are reconfigured for the new t_int. 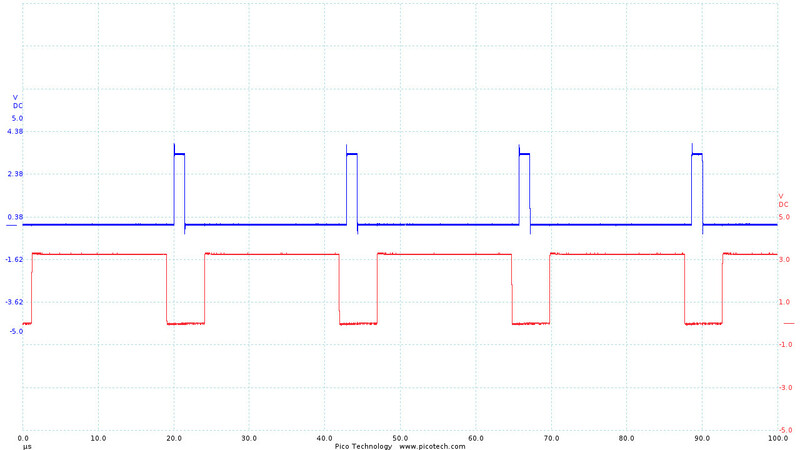 After one ICG-period with the requested integration time, the ADC is turned on. The ADC is active only during the read-out time for the CCD and only for the requested number of integrations. The timers run indefinitely until a new request from the user is received. Beware that there are three timer-polarity registers to invert around lines 60, 250 and 260 if you do not employ a hex-inverter between the MCU and the TCD1304. ¹ Read more about this the ADC section. ² Until recently I had misunderstood the ADC’s timing diagram, which led to the misconception that the ADC in single conversion mode needs a stabilization time (tstab) of 2 µs between every measurement. This in turn led to the conclusion that 1.4 MHz was about the top speed for the CCD with the STM32F401RE.